The Exo Terra Sand Mat has a natural desert appearance and can be applied as a safe & hygienic substrate substitute for your reptiles. The Sand Mat allows you to create a desert-like environment with a minimum of bacterial build up. Unlike loose sand or soil, the Sand Mat cannot be accidentally ingested. The texture of the Sand Mat enables your reptile to have a firm grip on the substrate, increasing your reptile's sense of safety and comfort. 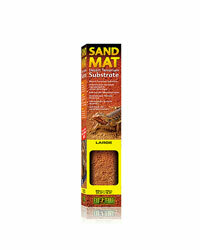 Sturdy, hygienic and easily removable, the Exo Terra Sand Mat is easy to use and can be cut to fit any terrarium size. Simply rinse clean when soiled or replace as necessary.